BE-92AE automatic chronometer with 38-hour power reserve. 43mm stainless steel Trip-Tick® case construction. Water resistant to 50 ATM, 500 metres. Integrated rubber strap. 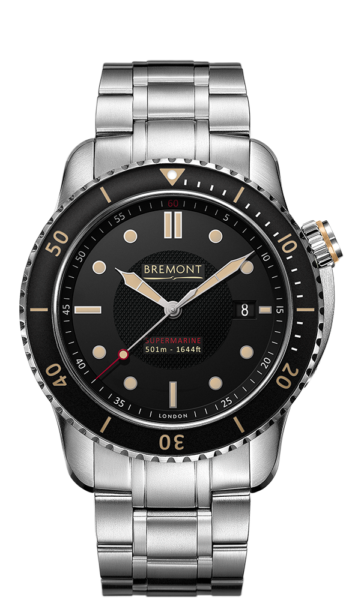 The first diving watch Bremont ever produced was the 43mm Supermarine 500 which was introduced back in 2009. Co-Founders Nick and Giles English had wanted to build a robust but beautifully engineered diving watch that was very practical in design, but also tied into the brand’s strong aviation heritage. The watch had to also hold its own against any other mechanical professional diving watch in terms of engineering, design and price point. The range was named as a tribute to the brothers’ love of the iconic British aircraft manufacturer responsible for the Supermarine S6B Schneider Trophy Seaplane and of course the incredible Supermarine Spitfire.